So, good old dependable Mercury is at it again. The storm period – when Mercury appears to slow down his movement across the sky – began on March 17th, according to Astrogrrl. Apparently, the storm period alone is enough celestial upheaval to throw life on planet Earth into chaos. Oh, did I mention, Mercury is retrograde in – wait for it – Aries! 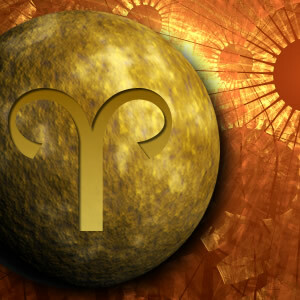 Aries, which is only the most passionate, fiery, and potentially devastating sign. Unchecked Aresian energy can set the world on fire, literally. On March 23rd, days before the full blown Mercury retrograde in Aries period began, there was a fire on my university campus at a major intersection that is literally the knee joint of student life. Every student – especially undergraduates, but many graduate students as well – must cross that intersection as a matter of necessity because it links a number of key university offices, student housing, and dining resources, in addition to having a very nearby transportation hub and student union. All of which are central to campus life. So, you can imagine my horror when I received a text message via our emergency notification system saying that this key quad corner was ablaze! Almost three hours after that text was frantically received, we got a text update indicating that the flames were subsiding due to successful efforts by the local fire department. It was around this time that I realized that Mercury was up to no good. “Aha!”, I thought. “Mercury is retrograde!” I was rather pleased with myself for figure this out all on my own without having to ask a witchy friend. “But why flames and destruction?” I checked Astrogurl and the secret tomes of the heavens opened to me. “Clearly, Aries has teamed with Mercury deliver mayhem”. Ok so as of that last text, the campus fire was quelled. My astrological radar appeared to be in tack. Phew, Aresian mischeif managed, infernal doom averted. Great, all in a days work. Um, not so much. About 23 hours after the “you can exhale” text regarding the Wednesday morning fire, we received yet another communication on Thursday morning saying that there was an active shooter threatening the campus. At this point, my heart was in my throat and I was clasping the knee of the nearest friend with eyes cast to the sky begging for a reprieve! And, tricky Mercury with his sensationalist buddy Aries delivered. We received an apologetic text several minutes after the original beseeching forgiveness for the completely awful shock that the erroneous text must have given us. Luckily, my intuation had kicked in after the initial shock subsided and kindly informed me that it was Aresian Mercury screwing with the world. Well folks, according to Astrogrrl, we have about a week more of retrograde Mercury in Aries. After, April 23rd the retrograde period will end but we will still have Mercury in Aries mean-mugging us, just minus the extra bad attitude that a retrograde cycle brings. This entry was posted in Astrology and tagged Aries Constellation, Chaos, Mercury Retrograde by Wandering Woman. Bookmark the permalink. My hubby’s vehicle broke down, a sure sign Mercury’s at it again. And just to prove it’s in Aries, I had a MASSIVE temper-flare up this weekend; something that never really happens to me. Seriously. Bad enough to throw things…although all I threw in anger was a plastic cup and a pen. But still…I was angry. Can’t wait for it to end!